Chris Seidl was among the 20 occupiers that were arrested on Nov. 5th, 2011, after Occupy Atlanta reoccupied Woodruff/Troy Davis Park. Despite the violent treatment received during his arrest, Chris kept his head high while he was dragged away and screamed “You can arrest me, but you can’t stop the revolution”. Another reason why Chris is a great voice for the revolution is the credibility he gives to the movement in this interview. Instead of trying to capitalize on his bruises and media attention to present himself as a victim, he elevates the conversation to a higher level. The cause is worth the fight and he understood the risks. In reaction to the brutal treatment of peaceful protesters by police forces on the West coast, a solidarity march was organized on November 11th, 2011. On December 17, 2011, the #D17 manifestation was organized accross the country for freedom of speech and for protesting against recently laws to be used for emprisoning protesters for long periods of time. Upon arriving in front of the CNN building, Occupy Atlanta met a group of protesters from the Congo. An energizing drum concert was then created with instruments from both group. 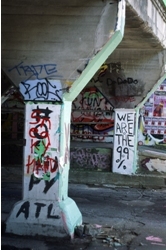 I met Paul Sylvester on January 1st 2012 while the Walking Occupiers were travelling through Winston-Salem, NC. Paul was in Iraq for 18 months and since leaving the army 5 years ago, he has been walking throughout the United States and Mexico. The image he projects is a reminder for everybody of how little we need to possess to be healthy and happy. In 1996, Eloise Pittman borrowed money to help her church from a predatory lender that inflated the value of her home to concoct a high commission loan that could never be repaid. She died in the fall of 2011 two weeks after being notified that foreclosure proceedings had been initiated by Chase Bank. On January 12th, after several weeks of occupation of the Glen Iris home, Chase decided to allow the Pittman family to renegotiate their loan. Occupy Atlanta will not celebrate until papers are signed and the pressure on the bank was stepping up yesterday, January 14th, with a huge display of solidarity. In this video, Carmen Pittman gives a speech in which emotions of sadness turn into a passionate determination to stand up against predatory lenders. 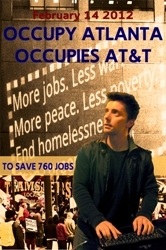 To protest against layoffs at AT&T, Occupy Atlanta and the Teamsters chose Valentine Day to show some love. This video segment is probably the most enthusiastic protest I’ve ever witnessed. Georgia Senator Fort explaining that bad legislation from the Senate is reflecting fear of the people and fear of the people’s power. Streets of Atlanta is a new photo blog promoting the potential of our neighborhoods for urban revitalization and strong local markets. The Durham Shooting Club was created to celebrate Durham's strong architectural bones and the pride its inhabitants exhibit for their community. Since 1995, just 10 percent of subsidized American farms -- the largest and wealthiest operations -- have raked in 74 percent of all subsidy payments. Yet, only a tiny fraction of the farm bill funding goes to programs that support healthy fruits and vegetables.